These three beaches are located in what we can call the center of the Khao Lak area. South to north they are Sunset Beach, Nang Thong Beach and Bang Niang Beach. Some of the big resorts do border the beach areas, just remember that all beaches in Thailand have public access. Located just to the north of Khao Lak Lamru National park, at the foot of the mountain in a small bay is where Sunset Beach is located. A small beach with 6 upper class resorts on the mountain side; Sunset Beach Resort, Palm Beach Resort, Bayfront Resort, Paradise Resort, Khao Lak Resort Hotel and Wanaburee Resort. All beach services belong to one of the resorts. To get to Sunset Beach you must either stay at one of the resorts on the mountain side or you can also walk there from Nang Thong Beach at low tide. Nang Thong Beach is one of the main beaches in the Khao Lak area, it was the first beach that got developed for tourists, more than 30 years ago. 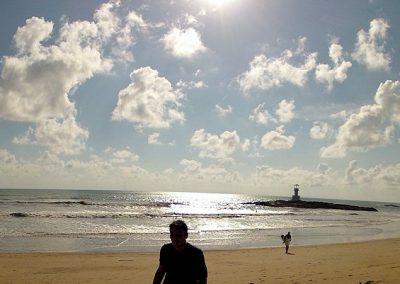 Nang Thong Beach which is located by Ban Bang La On which is known by tourists as Khao Lak Center. This is a good spot for a romantic sunsets. In the high season October – March the warm calm water of this beach are suitable for swimming at high and low tide. At the light cross in La On (Khao Lak Center) turn towards the beach past Nang Thong Supermarket, and at the next T-cross turn left, and you will end up at Nang Thong Beach. Bang Niang Beach is located between Khuekkhak Beach and Nang Thong beach from North to South. 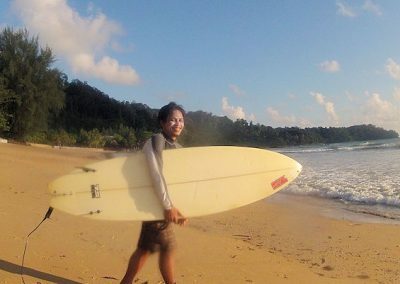 This beach is about 1.5 km on the Andaman Coastline, good for families and travelers who love the real nature. Tourists love to walk, sun bathe and swim here. At the T-cross where there are traffic lights in Ban Bang Niang, just by 7-eleven, you turn towards the beach and it is less than one kilometer to get to the beach. In Ban Bang Niang there are some of the well-known resort laying on the beach itself; Ramada, La Flora, Mukdara, Chongfah Beach resort are some of the more popular ones. Get to know the Khao Lak Area here.